Television veteran Johnny Young will entertain television pioneers at TVW Channel 7’s 50th Anniversary Reunion on Sunday October 18th, 2009. John who was one of the station’s first teenage stars, now hosts Radio 6IX’s Big Breakfast. He will reform and perform with his original Johnny Young and the Strangers band, consisting of John Young, John Eddy, Warrwick Findlay, Don Prior and Tony Summers. 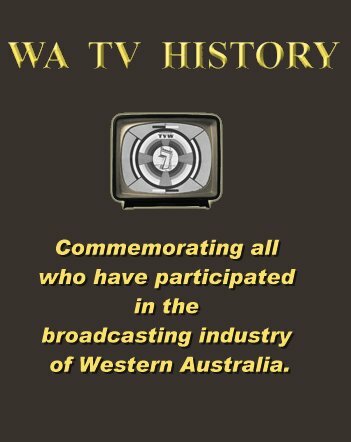 The veterans of WA’s television industry will reminisce about the early days of television in Perth when they gather at the October 18th celebration at Channel 7’s Tuart Hill studio – the same studio where the State’s first telecasts originated on October 16th, 1959. Fri 31st July, 2009 at the Swan Yatch Club 8 till 12pm. Sat 1st August, 2009 at the Dudley Park Bowling Club 8 till 12pm.